God willing and the creek don’t rise! Mary’s FINISHED replacement robe, complete with decorative stitching on the hem and neckline. I didn’t say it was pretty, but it is DONE in time for dress rehearsal. Progress! One sodden, RIT-dyed cape for Joseph is ready for the dryer! Yes, we lost costumes for Joseph and Mary. Fortunately, years before I took over, some kind mother made two white cotton capes. 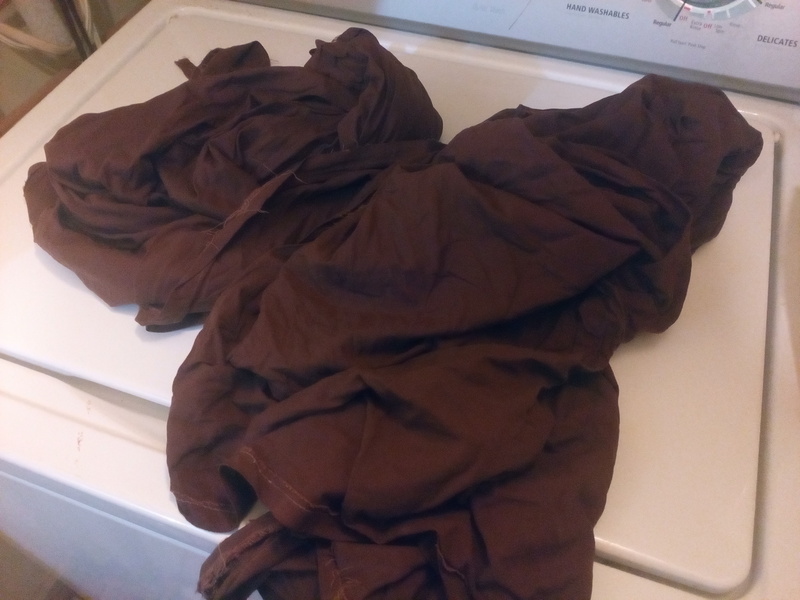 I dyed one brown for Joseph several years back, and kept the other one back in case we needed a cape of a different color. Well, the first brown cape is now in the landfill, so thanks to the magic of RIT, Joseph will have his traveling cape for Sunday’s pageant. And his traveling bag! Babs had stored the bag and the boxes the three magi carry in her VBS props box!! Yay!! (I was scared Wednesday afternoon that the boxes had been tossed also. Huge relief.) I have also made 5 robes and one poncho–Mary’s robe is the only full robe still needing to be made. And make sure there are enough headpieces/wraps for everyone.